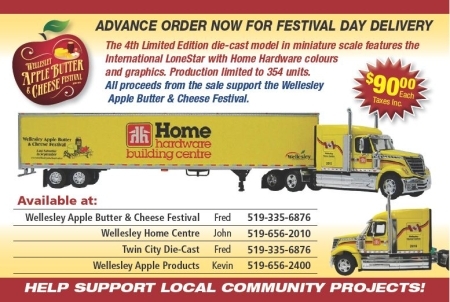 DCP33054 – The fourth model offered for the 2013 festival was a joint venture with Wellesley Home Centre. 360 were produced with limited quantity still available. $79.65 plus taxes. 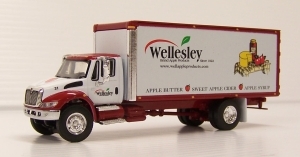 Dcp30929 – The first model offered for the 30th anniversary of the festival was a 379 Peterbilt with 3 axle reefer trailer. 150 units produced and quickly sold out. Dcp31401 – The second model offered for the festival was a Straight truck International 4400 dry box. 252 units were produced with limited quantity still available for purchase. $ 40.00 ea. plus taxes. Dcp31195 – The third model offered for the festival was a joint venture with Erb Transport. This travelling billboard trailer can be seen on our roads today being pulled by Erb Transport. 300 were produced with limited quantity still available for purchase. $79.65 ea. plus taxes.